‘Closed door’ restaurants (hosted in private homes) are hugely fashionable in Buenos Aires at the moment, so when my friend highly recommended Steaks by Luis, I booked right away ($79 USD for a set 5 course menu). The real fun is that it’s an asado (traditional Argentine BBQ), and you share the table with the whole restaurant (about 30 people). We started with an explanation of the cuts and the importance of salting the beef ahead of time. We then enjoyed empanadas, cut chorizo, salami and bread with a glass of sparkling to start, and had the chance to meet other beef-lovers. Next up was a fresh salad of lettuce, tomato, onion and apple – definitely needed ahead of the first hot course. The platter of assorted offal was delicious, with my childhood favourite of sweetbreads a highlight (so plump and tender), along with the intestine, pork and beef sausage, and ribs. 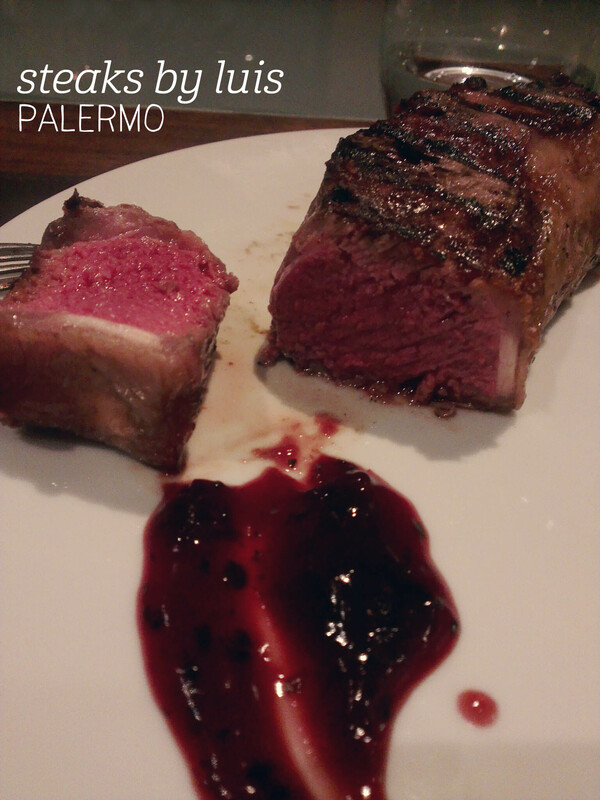 If that wasn’t enough meat, then came our 350g bife de chorizo cut – mine was medium-rare, and it was perfection. Tender, incredibly tasty and very, very filling, this was a perfect introduction to Argentine cuisine. Finally, we managed to fit in a sliver of dulce de leche cheesecake, which was pure decadence. Every course was perfection – fasting ahead of time recommended! Canberra cafes just keep getting better and better. 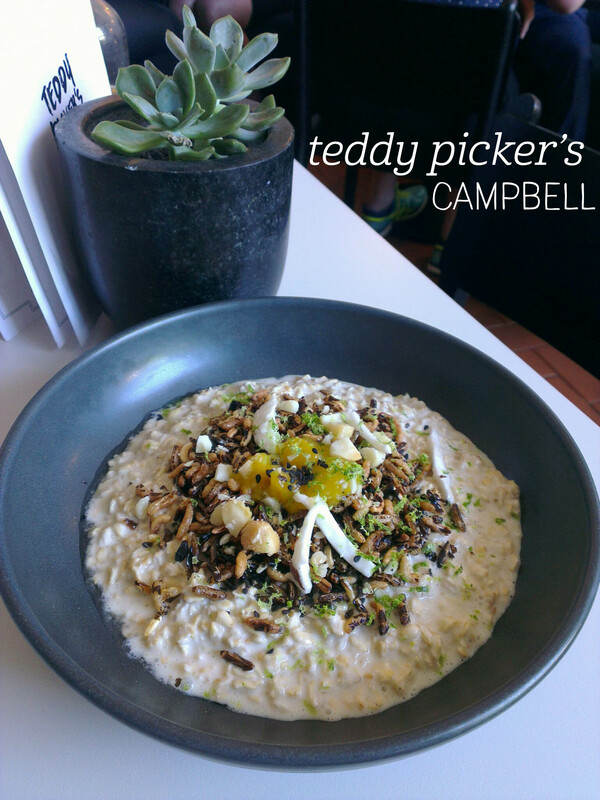 I met a friend for a weekday breakfast at Teddy Picker’s, a recent opening in Campbell, alongside The Pedlar. The space is vast and modern, but avoids feeling cold with plenty of greenery and a range of pickled goods for sale in jars (love the calligraphy on the labels!). I started with the very Instagrammable Purple Smoothie ($8.90), with blueberry, mango, banana, honey and coconut milk. The texture was great, but the coconut flavour dominated the smoothie, so you couldn’t pick the other flavours. For breakfast, I had the Oats (dairy free, yay! $13.50), served with coconut, mango, puffed wild rice and macadamias. The dish was huge, and beautifully presented. I absolutely loved this breakfast – the oats were amazingly creamy, served cold (perfect for a warm day, although hopefully they’re served hot in winter) and had just the right balance of sweetness, without being a ‘sweet breakfast’ as such. The mango and macadamia combo is a real winner, adding great textural contrast, along with the innovative take on wild rice. With friendly service and plenty of fun menu options to try, I’ll be back soon for sure! I found Casa Lastarria on my first day in Santiago and knew I had to eat there. Pushing through my jetlag, I stopped by for an early dinner on day two, and was not disappointed. 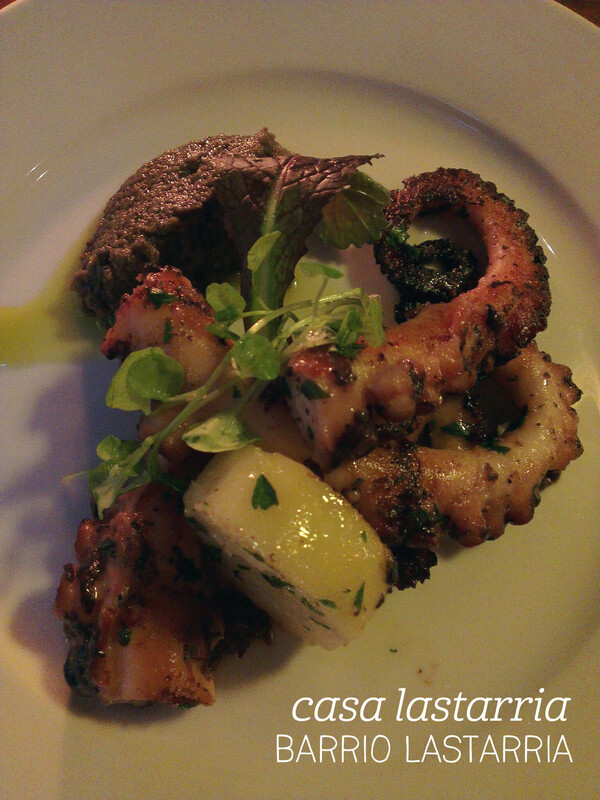 I started out with the Pulpo Asado (CLP $7900) – octopus cooked on the grill with an olive tapenade and confit potato. I am a huge fan of octopus, and this meat was so perfectly tender, octopus will never be the same again. The grilling added so much flavour, although I didn’t think the tapenade matched the dish at all in terms of flavour. Next up was the steak. I hadn’t yet realised that portions here are huge and you definitely don’t need an entree and main, so I was faced with a giant piece of skirt steak, served with potatoes, asparagus and a creamy dipping sauce. Unfortunately the skirt was tough and chewy, so that dampened the experience. The flavour of the beef was fabulous though, and I gobbled up the grilled asparagus quickly. There was no way I could finish the dish, so that was that, but I’d recommend sticking to one main or a selection of the excellent entrees. Well friends, we’ve done it once again. Another year of #icecreamthurs summer denial comes to an end – bring on the heat! On my first day on Easter Island, I wandered through Hanga Roa, getting my bearings and exploring Tahai for my first sighting of the impressive moai. 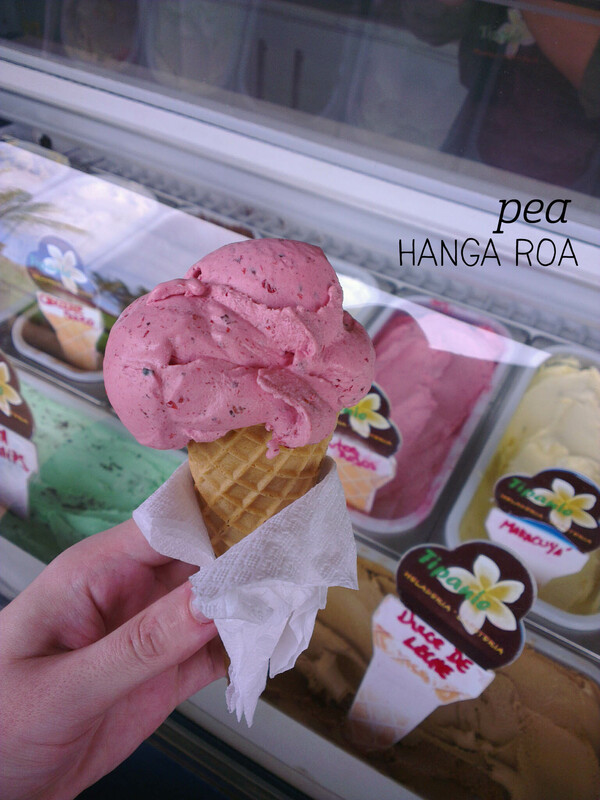 But it was a long walk, and on the way back I stopped in at Pea’s little icecream stall, hidden around the side of the building. With a fun range of flavours (and locally made), I couldn’t go past the frutos rojos flavour, which literally translates as red fruit. I presumed it was a fruits of the forest type mix, but the flavour didn’t have the heaviness of dark berries, instead being a sweeter, tarter mix of what must have been strawberrry, raspberry and blueberry. The portion was smaller than others I’d have on the island, but the quality was excellent. The icecream was beautifully rich and had such a creamy texture – I could have happily enjoyed this all day. Even better was the view – I grabbed a seat out on the pavillion which overlooks the ocean – life doesn’t really get much better than this! #icecreamthurs will return in autumn 2017. 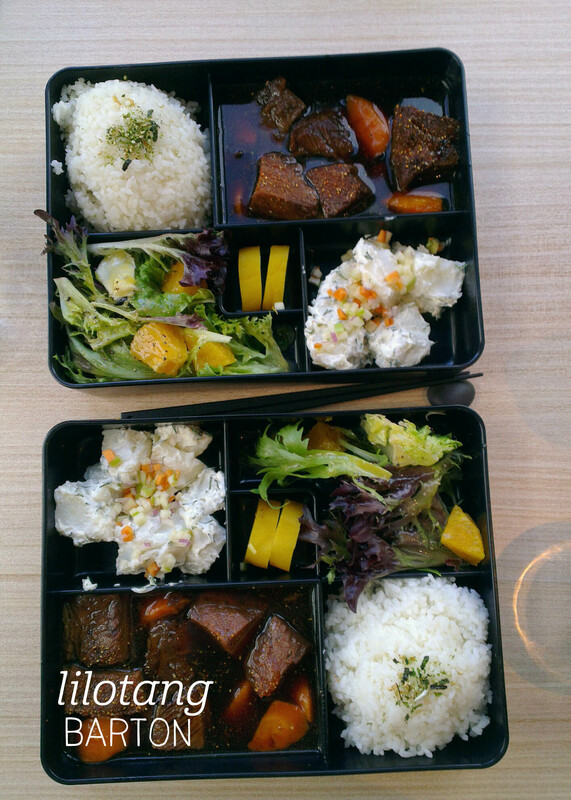 I’ve been meaning to try Lilotang’s $18 bento lunch special for a while, but finally got around to it on a Friday afternoon. After a busy morning at work, entering the cool, sleek space felt like stepping into an oasis. My friend and I both ordered the braised beef oyster blade with roast carrot bento ($18 each), and I added miso soup for an extra $3. I was particularly excited to see the potato salad in the bento, which is a Japanese side-dish staple. But first the beef. Braised to perfection, the beef melts in your mouth, eat portion chunky and tender and flavoured with a slightly spicy sauce. I was surprised they gave you a spoon, but it was evidently to drink the sauce with (we both cheated and poured it over the rice – so good). The roast carrots retained a bit of their crispiness, so they weren’t just mush, but had the right amount of give. I really liked the balance of having heavy potato salad, slightly heavy beef and rice, and light salad in the bento – the citrus dressing on the lettuce was lovely and refreshing. As always, I devoured the pickles and could have eaten several more. The bento are such great value and incredibly tasty. Love you long time, Lilotang! Spring is such a great time to head out to Some Cafe in Collector – the sunshine is delightful in the old homestead building, and the food is as fresh and locally produced as ever. Dad and I stopped in for lunch, and I couldn’t resist starting with a caramel slice, before our proper lunch order. Best. Caramel. Slice. Ever. Please, if you haven’t tried it, it’s worth the trip for that alone. 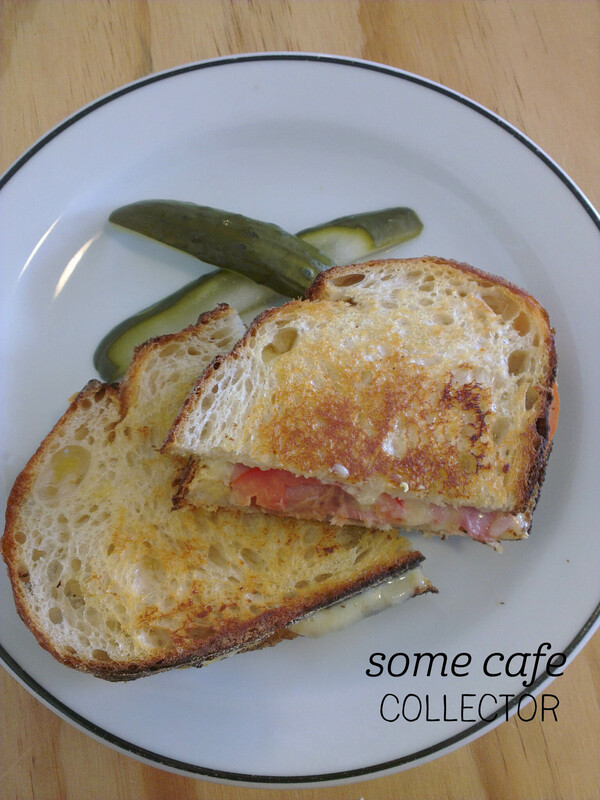 I ordered the Toastie ($12) for lunch, with BoxGum ham, tomato, cheddar cheese, mustard and mayo, served with pickles on the side (yes!). The bread was fresh and huge (luckily I was hungry), perfectly toasted and crisp. The simplicity of the toastie was what made it so good – the local ingredients spoke for themselves, with perfectly oozy cheese, fresh sliced tomato and the ham – oh yum! So much flavour bursting in each mouthful. I wish I could make them this good at home. Not to mention the pickles, which were beautifully tasty with a slight sweetness to them. As always the staff were lovely and welcoming – they didn’t even judge us when we bought a second caramel slice for the road! Westside Acton is an ideal place for a quick lunch in the sunshine, and Dad and I made the most of it on a warm weekday afternoon. 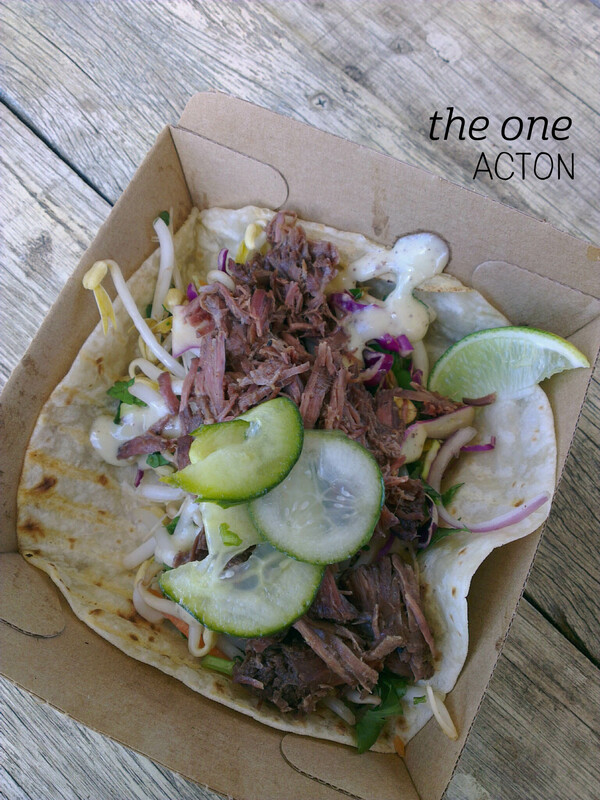 I wanted to try something I haven’t had before, so went for the beef tacos from The One ($6.50 each, or $12 for two). The food was ready quite quickly, and I was pleased to see how packed the tacos were! The real attraction here is the sous-vide beef, pulled, tender and well-seasoned – there was a good amount piled on the top and I found it more than met my expectations! I completed loved the mixed salad underneath (think bean sprouts, coriander, cabbage and onion), not to mention the pickled slices of cucumber on top (more please). The whole thing was wrapped in a fresh tortilla (no hard taco shells here) and with a drizzle of the lime wedge provided on top, it was a lively, tasty lunch. I was quite hungry, so managed to get through both, but next time I’d want to try two different ones to mix things up a bit. Dad loved his Cubanos too (yes, it was as good as I remember). Love this place!